Tunnel beneath a border fence. 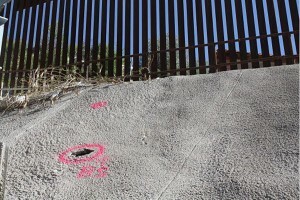 Concerned about drug smugglers and illegal immigrants coming into the U.S. from Mexico, the federal government built a fence to curb the traffic. It didn’t work, Vice News reports. The issue of a barrier at the border has picked up steam after Donald Trump promised to build an “impenetrable and beautiful” wall at the border. But people who actually live along the border in the Rio Grande Valley are extremely skeptical. 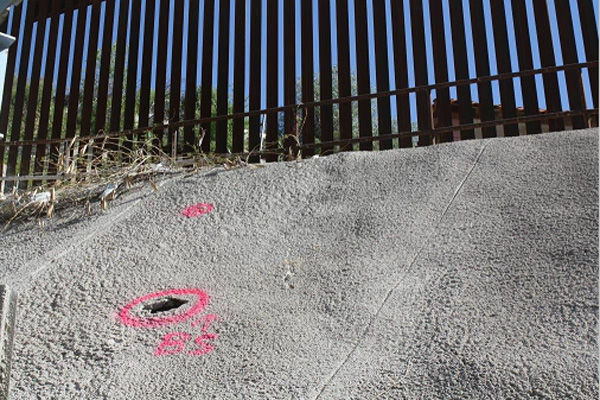 Border Patrol agents like Cabrera, local police, elected officials, and people who live with the existing wall in their backyards say it has been an epic boondoggle. Seemingly everyone in the area agrees that any plan to build a new wall or expand the existing fence is a bad idea. In Texas, the existing fence — or wall, depending on your definition of the term — mostly consists of rows of cube-shaped, rust-colored posts that stand about 20 feet tall. The columns are spaced about four inches apart, too narrow for even a child to squeeze through. But the fence abruptly ends in some places, leaving vast open stretches. In the most absurd cases, 30-foot sections of fence are surrounded on both sides by miles of wide open space. Posted: 11/4/16 at 9:00 AM under News Story.